LONG DOCK PARK (Dutchess)–Show off your pumpkin-carving artistry and see Long Dock Park ablaze with jack-o’-lanterns—including yours. Pumpkins will be available for carving Tuesday, Oct. 27, through Friday, Oct. 30 from 3 - 6 p.m. Friday night they’ll be lit and displayed throughout the park. NOTE: Pumpkins are free, but supplies are limited. Please register using the form below. Contact Scenic Hudson Parks Event and Volunteer Coordinator Anthony Coneski with any questions: aconeski@scenichudson.org, 845-473-4440, ext. 273. 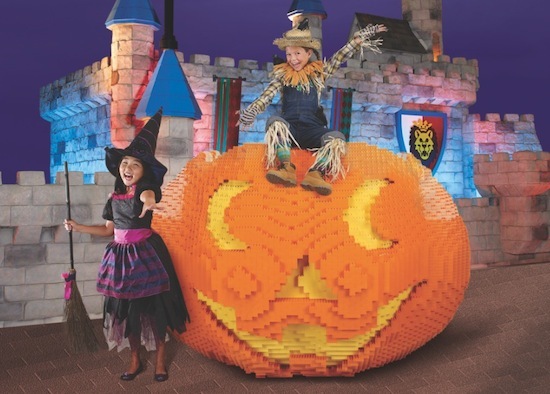 Come out and have a Franken-tastic time at LEGOLAND® Discovery Center Westchester at our Brick-or-Treat Halloween Party! Join us for lots of safe Halloween fun for the whole family! Wear your costume and receive $3 off Admission at the door! See more than 7,000 individually hand-carved, illuminated jack o' lanterns in this elaborate walkthrough experience. Meander through an historic, 18th-century riverside landscape and discover a breathtaking display — all made of jack o' lanterns! A giant sea serpent adds some hiss to the Undersea Aquarium while comical, squash-eating Venus pumpkin traps sprout in the garden. Blaze's perennially popular Jurassic Park includes a triceratops, a pterodactyl, a brontosaurus, and a T-Rex! Come gawk at more jack o'lanterns than ever before. Tens of thousands of visitors experienced last year’s Blaze®, which was sold out EVERY NIGHT! Complete with sound effects, elaborate synchronized lighting and an all-original soundtrack by recording artist Richard Christy, this not-to-be-missed spectacle is the area’s most innovative Halloween happening. This exciting and innovative structure is intended to provide a safe area for swimming and wading in the Hudson River for people of all ages and to promote use, awareness and stewardship of the Hudson River. The first phase of the River Pool is a 20’ prototype wading pool which will be used to test the concepts and materials. A larger, full use swimming pool will be constructed during Phase 2. Provide access to the Hudson River via a facility inexpensive to the public. Educate the general public about the importance of continuing to preserve and clean the Hudson River. Promote swimming as a fun healthful fitness activity in a natural environment. Demonstrate to other communities the viability of floating pools by building a successful prototype. a ramp leads to the pool. This prototype pool is 20 feet in diameter with a water depth between 24 and 30 inches. The pool bottom, a high strength net made of Dyneema twine, is held in place by a rigid structural perimeter tube. Floatation/seats line the perimeter of the pool - offering pool users spectacular views of the River. The pool is used from early July to Labor Day and is stored in sheds at Riverfront Park in the winter season. The success of this prototype will facilitate the development of larger and deeper floating pools in the future. The river pool is located just off the north shore of Pete and Toshi Seeger Riverfront Park – a central destination for local youth and adults. The park is only minutes away from Beacon’s train station and ferry dock as well as regional attractions such as DIA: Beacon and the Beacon Landing peninsula. The water quality at the River Pool site is one of the best in Dutchess County. In the 19th and early 20th Century floating bathhouses dotted the perimeter of Manhattan. These submerged wooden cages were open to the flow of the river- and allowed for safe swimming and bathing. Similar “flow-thru” river pools were found in Paris and other European cities and a few are still in active use in Switzerland’s rivers today. Today, due to considerable water quality improvements in the Hudson River and growing community interest in recreational river swimming, the construction of a River Pool is once again a timely endeavor. River Pool will be open Tuesday through Sunday (12noon to 6pm) from early July to Labor Day. See you at the pool! Copyright ©2015 River Pool at Beacon Inc, All Rights Reserved. Please Help Find Pierce Crowley ! 15 Year Old Needs Your Help NOW ! The Crowley family of Manursing Way in Rye has reported their son, Pierce Crowley, missing. He was last seen Friday in White Plains. Here is the "missing" flyer you can post in your store or neighborhood. The above Photo is PIERCE CROWLEY, HIS FAMILLY NEEDS YOUR HELP IN LOCATING HIM AND BRINGING HIM HOME SAFELY. PIERCE IS 15 YEARS OLD- 5 FEET 10 INCHES AND 150 POUNDS. BLUE EYES, LIGHT BROWN HAIR, WEARS BRACES. PIERCE WAS LAST SEEN FRIDAY 25TH MAY, 2012 IN WHITE PLAINS, NEW YORK- POSSIBLY NEAR THE TRAIN STATION. HE WAS LAST SEEN WEARING DARK JEANS, A BRIGHT BLUE FLORIDA GATORS SHORT SLEEVE T-SHIRT, AND BLACK SNEAKERS WITH LIME GREEN TRIM THERE IS A REWARD FOR INFORMATION LEADING TO HIS SAFE RETURN. Please contact the White Plains Police at 914-422-6111 with any information. "as some of you may already know, our dear pierce is missing. he was not feeling well before he disappeared and is in a fragile state. it is URGENT that we locate him ASAP. attached is a flyer with information and a picture. please share it with any and all. police, taxis stands/drivers, train stations, recreation centers, playland, skateboard parks, fastfood places. typical 15 year spots. if one of you could keep track of where the information is being shared, posted that would be helpful. don't want to duplicate and even more importantly we don't want to miss any spots. if you need copies - i will leave a pile by my front door for you to use. thank you all so very much for helping us find pierce as quickly as possible. New York City Schools Chancellor Dennis Walcott says it would be “irresponsible” to draw conclusions about teachers only from their rankings. More than a dozen city teachers got the lowest possible score on the Education Department’s controversial instructor rankings, a Daily News analysis has found. Seventeen teachers received zeros in either math or English on evaluations of how well they raised student achievement over more than one year, according to city data released Friday. Meanwhile, 47 teachers aced the evaluations, each scoring a 99 out of 100 in math or English. Of those instructors, three recorded highest scores in both subjects. The lowest-ranked instructors taught at both high- and low-performing elementary and middle schools around the city. All had at least three years of teaching experience, making their scores more reliable. The Education Department rated teachers using a complicated “value-added” method, which measures how well students improved on state exams compared to a projection of how they should have performed based on demographic factors like poverty and ethnicity. In all, 20,000 fourth- through eighth-grade math and reading teachers received at least one yearly evaluation between 2007 and 2010. The News’ analysis only includes about 8,000 teachers who taught in 2010 and have more than one annual evaluation. These were viewed as the most reliable of the numbers. Still, those with zeros challenged the accuracy. “I'm absolutely being scapegoated,” said Mirta Serrano, 53, a sixth-grade teacher at Brooklyn’s Intermediate School 318 who got a zero after two years of evaluations. The rankings, requested by the Daily News and other media outlets under the Freedom of Information Law, were made public after a year-and-a-half legal battle by the United Federation of Teachers. They divides teachers into five categories depending on their scores. About 1,384 teachers received a score of 24 or lower — the bottom of the scale. In math, about 1,347 instructors got a 24 or below. About 1,435 teachers recorded a 75 or above in English, making them top performers, while about 1,630 math teachers received a 75 or above. Schools Chancellor Dennis Walcott said he hoped the data will create a dialogue among parents, teachers and principals. "I think thoughtful discussions taking place at the schools between parents and principals and teachers is something that's extremely healthy that benefits our students," he said Friday. The teachers union and education advocates have ripped city officials over the release, calling the data deeply flawed with the potential to demonize instructors. "This was a complete calamity and it is the clearest example of the mismanagement that the Department of Ed has put upon the teachers of New York City," United Federation of Teachers president Michael Mulgrew said. Even Walcott warned that the data is old and cautioned against drawing conclusions. "I definitely believe in transparency and people having information,” he said. “On the other hand, I'm very conscious ... the data with the names attached could be used in ways that could be harmful to the process of what we're trying to achieve."
. The average margin of error on multi-year scores is 35 points for math and 53 for English. On some individual teacher rankings, the margins of error become even more troubling, going as high as 75 for math and 87 for English. "The fact that one teacher in a school might be at the 60th percentile and another one's at the 45th percentile doesn't mean that the first teacher is more effective than the second because they come with very large margins of error," said NYU Professor Sean Corcoran, who has studied a similar ranking system in Houston. The UFT said the rankings are also riddled with straight-forward errors like assigning the wrong students to instructors. Pamela Flanagan, a teacher at Tompkins Square Middle School in the East Village for the past six years, initially received a zero in a 2009 report. There was one glaring problem: she was evaluated as an English instructor when she only taught math and science. The city has asked teachers to come forward to report any flaws, but so far only 37% have verified the last two year’s of their reports. Of those, 3% were connected to the wrong courses. Another problem, critics say, is how small achievement changes among high- and low-performing students dramatically skewed the evaluations. For example, teachers of top-performing students could see their ranks plummet if their kids get just a couple more questions wrong than expected on state tests. That didn’t stop three teachers at A-rated Public School 122 Mamie Fay in Queens from each scoring a 99 on their evaluations. One of them — Rebecca Victoros, who teaches fifth-grade in the Astoria school’s gifted and talented program — even earned the top honor in both English and math. While the department no longer uses the rating system, the state will use similar calculations in judging the performance of teachers under the program recently established by Gov. Cuomo. Those calculations will be supplemented by other measures, including classroom observations that many education experts say are necessary to fairly evaluate a teacher. Instructors who fall into the lowest band will be subject to firing.